Avoid the “summer slide!” Encourage your kids to read and reap the rewards this summer! Read 10 books, get one free! (Ages 12 and under). Kids earn a free book selected from a list of titles when they read 8 books and record them in the reading journal. Enter for the chance to win a NOOK Color by checking the NOOK contest box on the entry form. Download and print out the Reading Rewards Calendar. Read a book each day for two weeks and redeem the completed form for 10 free tokens. Enter to win a gift card for your child and their classroom. Have your child complete five age-appropriate worksheets and submit the worksheets along with the entry form. In addition, entrants must write a short paragraph (150 words or less) about how you think working on the Sylvan workbook pages has helped your child. A free 6-week program to help children discover the joys of reading that includes daily emails, advice for parents, book suggestions and the chance to win prizes. 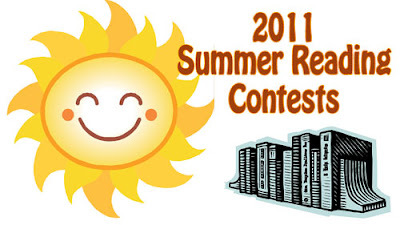 Log reading minutes and enter sweepstakes, win digital prizes and help set a new world record for summer reading. The public libraries in Wisconsin as well as many libraries throughout the nation use the Collaborative Summer Library Program (CSLP) materials to plan summer programs. The 2011 children’s theme is "One World, Many Stories" and "You Are Here" is the teen theme. This year some libraries may also offer an Adult Summer Library Program. This year’s CSLP adult theme is "Novel Destinations." Make sure to visit your local public library this summer with your family and participate in the free summer library programs! If you live in Wisconsin, the public libraries are collaborating with the Wisconsin Historical Society. Ask your library if your child is eligible to receive a free pass to a Wisconsin Historical Site or Museum. Oh, this is great. Thanks so much for letting us know about these fabulous opportunities for reading...and for getting more books! Thanks for this list of reading challenges for kids. Finally, this year, our library has an appealing summer reading challenge for my 11 year old. She is excited about it and I hope it is a solid program. Love this list! Will link back to you. Thanks!